Just like digital publishing, crowdfunding is something that makes being an indie creative totally feasible. Kickstarter is basically synonymous with crowdfunding, and the first place anyone should look when they’re getting ready to raise. 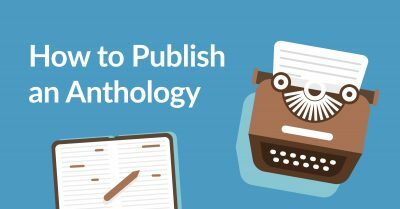 Kickstarter has a whole section of their site dedicated to publishing projects. 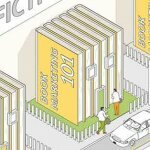 This is both an awesome way of supporting the community of publishers, and also a great place to go find cool books by new authors! Maris Kreizman is Publishing Project Specialist at Kickstarter. We talked about what’s most important to running a successful Kickstarter campaign, how you set the budget for your campaign, and everything you need to think about before getting started. It’s a trove of advice for indie authors - enjoy! What do authors need to keep in mind when they’re trying to get funding for a great publishing project? There are three important parts to doing a Kickstarter. The first one is telling a good story. That includes having a wonderful video, and telling potential backers who you are and why you want to do the thing you’re trying to do. The second part is rewards - making sure that potential backers are able to share in the project in some meaningful way. The third part is having a relationship with your backers, which means doing a lot of updates, keeping the lines of communication open, and being really transparent about what you’re doing. The relationship creators have with their backers sounds really cool. It’s more than just ‘goodies’ but an ongoing relationship. One of the most common misperceptions about Kickstarter is people think you need to have a t-shirt or a tote bag. Certainly those are wonderful, but especially in book publishing projects most people want to get the book, the actual thing that’s being made. Experiential rewards are also really wonderful, whether it’s a Skype chat or a little Q&A with the author - anything that builds a relationship. It seems like there’s two kinds of projects on Kickstarter. 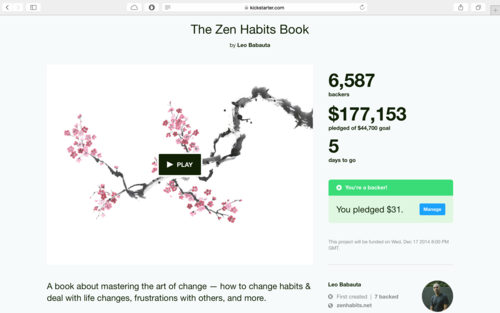 You get people coming in with their audience from somewhere else, like Leo Babauta of Zen Habits. And then you get people who are starting without that pre-existing community. Does this affect how creators should be planning to share their projects? Regardless of who you are and what you’re trying to do, coming in with some sort of base audience is key. So even if you haven’t fully established yourself, have a base level of supporters. That’s maybe just people you know - sending out a link to your family and your friends who want to support you -or, it could go a little deeper, trying to be a part of the community that you’re writing about, posting to blogs, coming in with an email list, stuff like that. I think that Kickstarter is wonderful in helping you spread your message and making your audience bigger. Even if it involves potato salad! *laughing* If you look at it, he did a really lovely job in putting the project together! 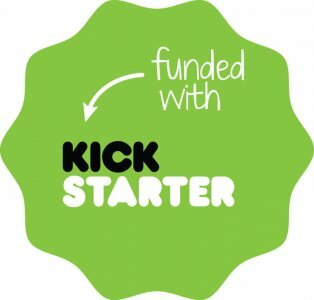 It was very simple, and maybe not the most exciting, innovating way to use Kickstarter, but he did a good job and he was really good at communicating with the people who though his idea was clever! I’ve read you elsewhere talking about ways Kickstarter isn’t just about raising funds to cover publishing costs for a single book - could you talk about that a little? 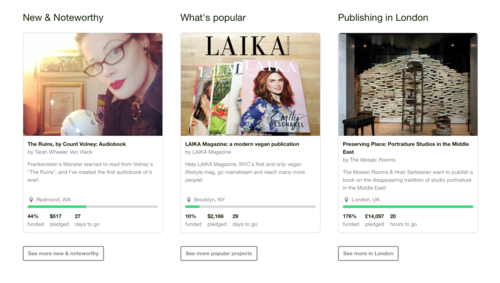 There are so many different cool ways to use Kickstarter in publishing. I’ve been talking to a lot of small literary presses and magazines about funding a season - “Help us do Spring 2015” and whatever that encompasses, whether that’s a couple of books or a couple of issues. Book tours for sure. Being able to do research is a huge deal. 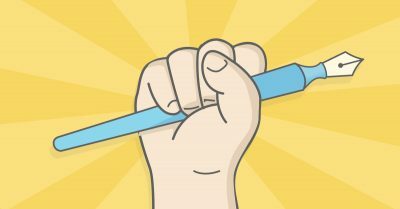 Think of Kickstarter like a grant - if you’re writing non-fiction and you have research to do it absolutely makes sense to raise money to do that, even if you’ve already figured out how you’re going to publish. You were talking about creators telling their story on Kickstarter - what does that mean exactly? There seems to be a wide variety of budgets for publishing projects, both very high and very low. How should writers budget their projects for Kickstarter? I think the most important thing is to go back and really plan out exactly how much money you’ll need to do the thing that you want to do in the way you want to do it, and ask for that amount. That way, if you don’t raise it you won’t have to worry about doing it half-heartedly. And then if you do go above and beyond you can worry about that whole other great kind of problem! How important is it for writers to be investing in specialist help for things like producing an introductory video? Is something with extremely high production values essential? This is a challenge for any publishing project on Kickstarter, basically. Kickstarter is a visual platform, and not every writer is going to be good at that kind of stuff. I’d say that it’s very important to give backers a feeling of what you’re trying to do, but also to allow the words to speak for you. If you’re not a video expert or an artist, it’s still OK.
I’ve seen projects work with a video taken from a phone that really captures a mood, and I think that is enough. The video is important, but it doesn’t have to be really ‘well-produced’ or ‘beautiful looking’ - I think it’s really helpful to just give a sense of who you are and what the thing you’re making is. 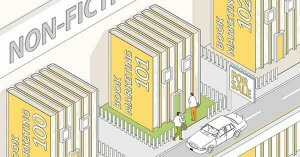 Is Kickstarter publishing a recent thing? Do you have any favourite projects you’ve seen come through? What sort of projects do you like? Publishing has been around on Kickstarter since it started out around five years ago. I came on board in March and I’m really excited about going to work with smaller presses. That’s one of the big things that I’m interested in. ‘Guernica’ magazine just did an annual print edition. It’s a beautiful piece of art, as well as the stuff inside it being pretty wonderful too! I was really happy I was able to help them make that. Children’s books do really well on Kickstarter. There’s a project called Hello Ruby, a book for girls to start learning the basic language of coding. That took off like crazy, and that book was eventually bought by a publisher. Do you personally select the Staff Picks? Yes, any member of the Kickstarter staff is empowered to make staff picks. Kickstarter also has a separate editorial team and they’re really in charge of curating the site for us. We work very closely together - I certainly pitch the projects that I’m excited about to them. There are a bunch of different ways that they’re able to feature a project. They have an email newsletter they curate that’s really popular. We also have a blog and social media and that kind of stuff. They do it all. What sort of things do you like to see in a project? Particularly if you’re an individual, it’s very important to talk about how you plan to actually get the thing made. What does that plan consist of? 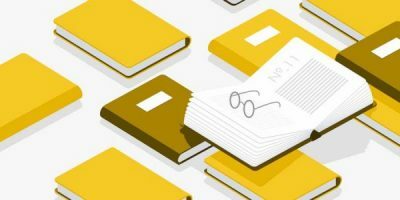 That they’ve talked to publishers, that they have a price quote for how much it would cost to print x amount of books… I often say that self-publishing is not something that you should really do on your own. The idea that you might have an editor or designer lined up, or that you yourself are already a wonderful designer and can show that to us. It’s about ‘Has this person thought through the practicalities of getting this book out?’ Backers are really skilled at picking out the projects that they think will succeed, and where they’ll end up with whatever reward they’ve put in for. Anything you can do to communicate to backers that you have a plan for this whole thing, and to get them the rewards that they want, is key. Do you have any advice for authors on how to structure the rewards they’re offering? 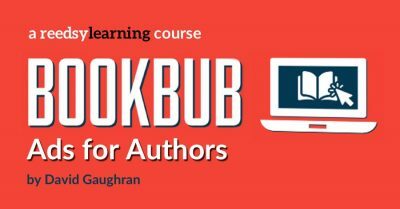 Are there any resources authors can go check out, or somewhere the can send you questions? If you want publishing specific advice, you can email publishing@kickstarter.com. That’s how you can reach me. I would recommend though looking on the Kickstarter site. There’s a creator handbook that really goes into some of the nitty gritty details of how to do a successful Kickstarter project. Thanks for your time Maris. 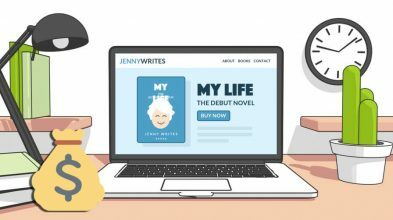 Have you ever tried crowdfunding for a book or a series? What have been your takeaways? Do join the discussion in the comments below! How many of the projects are seen through to completion? How many of the backers actually get the products they pay well in advance for?